o Net claims of non-residents on India declined by US$ 1.8 billion during the quarter (Table 1). o Indian residents’ overseas financial assets increased by US$ 19.6 billion, a substantial portion of which came from increase in reserve assets. o Foreign-owned assets in India increased by US$ 17.8 billion with broad-based contribution from portfolio debt securities, trade credit, commercial loans, foreign direct investment and currency and deposits. 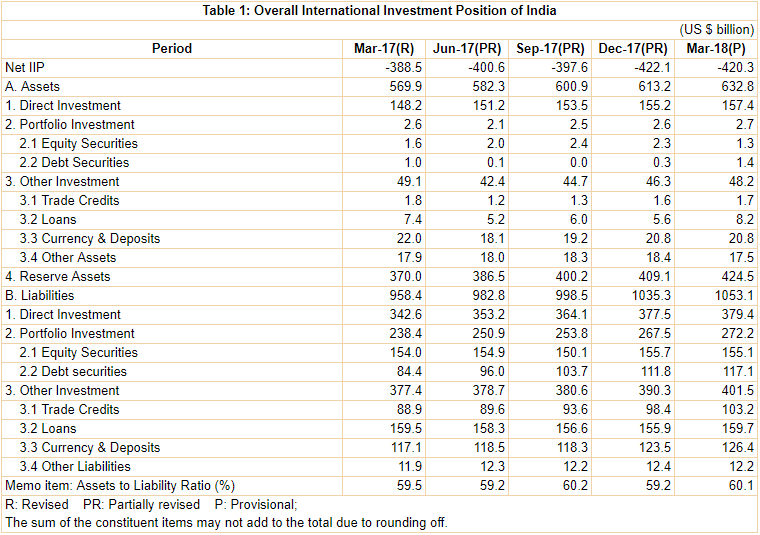 o Reserve assets accounted for over two-thirds of India’s international financial assets; overseas direct investment was the second largest category of assets (Table 3). o Debt and non-debt liabilities had nearly equal share in total liabilities to non-residents (Table 4). o The ratio of India’s international financial assets to international financial liabilities stood at 60.1 per cent in March 2018 (59.2 per cent in December 2017). o There was an increase of US$ 31.8 billion in net claims of non-residents on India during 2017-18, as the increase in foreign owned assets in India (US$ 94.7 billion) exceeded the increase in Indian residents’ overseas financial assets (US$ 62.9 billion). o The major portion of the increase in India’s international financial assets came from reserve assets. o Direct investment, portfolio debt investment, trade credit, and, currency and deposits contributed to the higher increase in liabilities to non-residents. 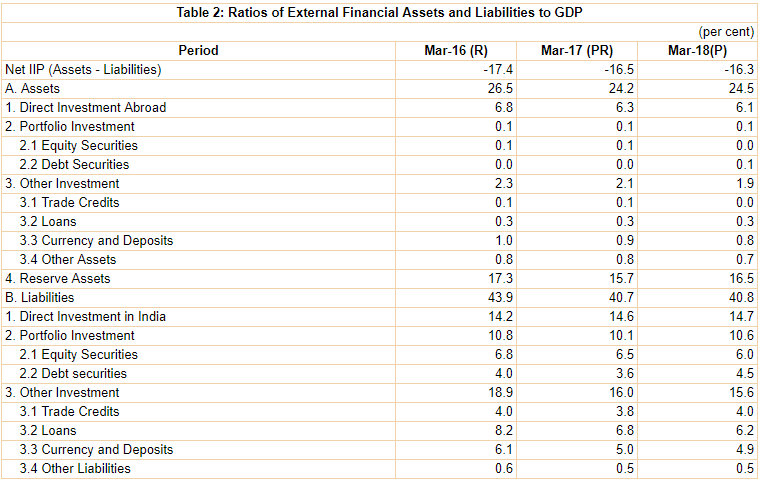 o The ratio of total international financial assets to Gross Domestic Product (GDP) at current prices, increased marginally to 24.5 per cent in March 2018 from 24.2 per cent a year ago (Table 2). The ratio of reserve assets to GDP increased to 16.5 per cent in March 2018 from 15.7 per cent a year ago. o The ratio of total international financial liabilities to GDP stood at 40.8 in March 2018, nearly same as a year ago. o The ratio of net IIP to GDP was (-) 16.3 per cent in March 2018.